New year, new site, new blog feature? Why not! With the recent launch of my new website I’ve decided to also reinvigorate my blog. By reinvigorate, I mean “bring back from the dead.” One of the features I’ll run regularly here will be “Behind the Image”, in which I will write about the making of one of my photographs. These will not be technical articles about how I used the hyperfocal point with a wide angle lens on a super awesome camera to blah blah blah. Rather, these will be the backstory - what I was feeling, why I wanted to photograph the location, my experience creating the photo, amusing anecdotes, etc. And yes, for those who just have to know, I will include the technical details. 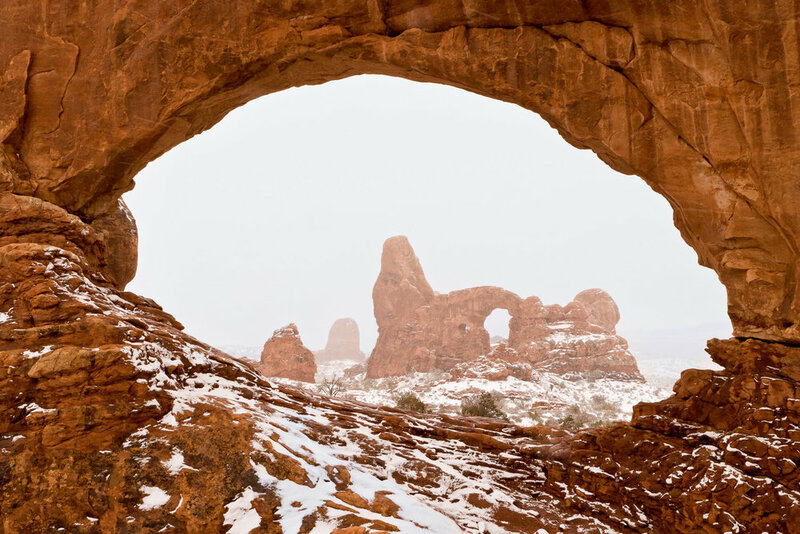 I’m kicking off the series with this image of a snowy day in the Windows area of Arches National Park. I made this image on February 27, 2007, about six weeks after breaking my back in two places in a car crash. No, this activity was not doctor approved but after spending weeks lying around the house I was flirting with insanity and knew that a quick jaunt to Arches would refresh my mental state. So, off I went. If you’ve photographed Turret Arch through North Window you know that the scramble over exposed slickrock one must do to achieve this view can be a bit hairy even in good conditions. Doing it in snow and ice while carrying a pack on a recently broken back is just stupid. Nevertheless, I did it and luckily, everything turned out just fine. I had envisioned warm sunrise light bathing the sandstone, which itself was freshly blanketed with pristine snow. It quickly became clear that wasn’t going to happen. Plan B? A moody image of fog and falling snow. I ran with it and made the image you see here. In retrospect, I’m thankful old Mother Nature guffawed at my original plan, something she is wont to do. I think this image is more unique, and if image sales are a good barometer I’d say my clients enjoy it, too. I still recall the absolute peace and a very real sensation of gratitude I felt standing on that little knob of rock, snow falling all around me and the cold air chilling my face. The crash that broke my back easily could have killed me. It felt like I’d been given a second chance and at the time, I swore I wouldn’t waste it. For a while, I didn’t. But over time, work got in the way and excuses were easy to come by, and I kind of got off track. As I type this I’ve got casts on both arms. Last November I fell off a small cliff while mountain biking with my family in Sedona. I broke both arms, a few ribs and suffered several other injuries. My head and face slammed into the rocks but were not seriously injured thanks to my helmet and sunglasses. Once again, I was lucky to be alive. It was another wake up call. This year, I’m resolving once again to make changes, to get outside more, to appreciate every moment I have with my wife and son. And, I’m dipping my toes back into photography. All the downtime over the last seven weeks has allowed me to revisit images, start writing again and build a new website. It’s stoked my creative fire for the first time in a few years, and that inner warmth feels damn good. This photograph may be licensed for commercial or editorial use and is also available as a beautiful fine art print in a variety of sizes. Please visit my contact page to inquire about pricing or to discuss print options.